Challenge yourself with a 375km cycle from the Inner Hebrides to the North East Scottish coast. Spread over four days of riding, our journey will lead us along the famous Lochs of Scotland, through the Great Glen and passing Ben Nevis' great peak, showcasing the best of this glorious country by bike. This four-day cycle spans the breadth of Scotland linking two key distilleries; Ardbeg and Glenmorangie. Rolling out from the Ardbeg Distillery in the South of the Isle of Islay, a short 37km cycle to the North of the Island makes for a short warm up on the first day to Port Askaig, where the Ferry will take us back to the mainland. From our overnight stay in Tarbert, we'll start our journey across the mainland, heading due North and along Loch Awe to spend our second night in Oban. The biggest hills are now under our belts, as we head North East along Loch Linnhe, through Fort William with the peak of Ben Nevis to our right, past Loch Lochy and on to our rest place for the night, Drumnadrochit. 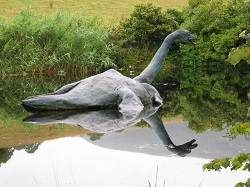 Nestled next to Loch Ness, watch out for the mythical monster as we cruise along the spectacular highlands roads. The final leg takes us through Inverness and over the Beauly Firth bridge and then the Cromarty bridge before reaching our destination of Tain, home to the Glenmorangie Distillery. Prepare yourself for a scenic journey to our start line at the Ardbeg distillery, flying from London to Glasgow before hopping on the local aeroplane over to the Isle of Islay. A short coach trip will deliver you to the distillery where you'll be reunited with your bike or hire bike, and after a short break, saddle up to start our Scottish epic. 38km on Islay will take us to the North side of the island to catch the ferry back to the mainland, where we will reach our first night in Tarbert after a short 12km ride. Time for a refuelling dinner and good night's kip before starting the main part of our journey in the morning. Starting early after a hearty breakfast, we'll have the whole day to take in this glorious route. 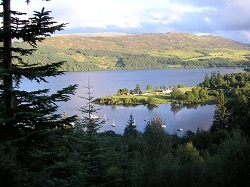 Heading North firstly along the sea loch and then past Loch Awe. We'll reach our peak elevation today but don't fear - 200m is nothing on an Alpine Col! It's downhill from here to our second night's stay in the lively seaside town of Oban, frequented by passengers of the Hebrides ferries and fishermen alike. Today is our longest day in the saddle, but also promises to be one of the most spectacular. Crossing the sea Lochs Etive, Creran and Leven, we'll continue Northbound for Fort William. Next, we pass Great Britain's tallest mountain, the mighty Ben Nevis, as thankfully we only have to climb a fraction of its 1345 metre peak! Further along we'll sail by Loch Ness to roll into our home for the night in Drumndrochit. A very well earned dinner before bed and our final stage tomorrow. It's a shorter day in the saddle for our grand finale to reach the Glenmorangie Distillery in good time, but we won't be compromising on the scenery today. Starting off along Loch Ness, we'll follow the River Ness into the historic city of Inverness. Over the Beauly Firth bridge and then the Cromarty bridge we go, before the final few kilometres to Tain, home of the Glenmorangie Distillery. Time to scrub up and enjoy your evening's entertainment here. Will be in simple but comfortable hotels throughout the event (including breakfasts). The standard of accommodation may fluctuate throughout the trip, but is designed to be functional and to enable us to get a good night's sleep. You will be sharing in twins or triples. If you require a single room then please request this at time of booking (a small supplement will be payable, subject to availability). Experienced cycle leaders, full vehicle support and driver/mechanic, baggage transfer, 4 nights hotel accommodation including breakfast. Picnic or cafe lunches will be provided, along with evening meals each night, apart from the final night where we will be hosted in Glen Morangie. Transport to the airport at the start and end of the event. We'll be hoping for mild warm and sunny weather, but remember this is the UK so be prepared for every eventuality... Be ready for hot and sunny conditions, protecting against the sun but also pack rain jackets and warmer clothes too, just in case!